Vella's music is lyrically and rhythmically engaging. His music creates a sense of deja vu and irony. Born in Melbourne, 1954, Richard Vella's diverse output includes works for orchestra, large ensemble, choir, film, chamber music, burlesque cabaret, music theatre, site-specific performance, and popular music genres. Many of his works are now recognised as set repertoire such as his Tango, for clarinet, and the guitar solos Between Earth and Air and Mirrors of Fire. His film credits include Light Years, Parklands, Renzo Piano: piece by piece (for which he won the 1999 Australian Screen Composers' Award for best music for a documentary) and Mr. Strehlow's Films. His most recent feature film music score is Travelling Light (2003) for which he received the nomination 'Best Music for a Feature Film' by the Australian Film Institute. Recent works have been The A to Z of Spiritual Music: a user's guide, commissioned by the Seymour Group (2006); his co-production of the Warner's international release of the Ten Tenors' album Larger than Life (2003) and a revised version of his music theatre work Tales of Love (2002). Vella was founding artistic director of Calculated Risks Opera Productions. Calculated Risks has premiered three of his major works, Tales of Love (1991/2002), The Last Supper (1993) and Bodysongs: the Fatman Tour (1998). These works have toured nationally and internationally in various formats. An important aspect of these performance works was its approach to interdiscplinary practice, collaboration and the belief that music is a vehcle for the communication of cultural, political, social and philosophical discourse. Publications discussing his performance work are Arias: Recent Australian Music Theatre (Redhouse Editions, 1997) and The Oxford Dictionary of Australian Music (Bebbington Warren, ed., Oxford University Press, 1998). Since 2007 he has been Chair and Professor of Music at the University of Newcastle. He has held many professorial consultative positions with various universities in Australia. From 2008 to 2013 he was Head of School of Creative Arts at the University of Newcastle. 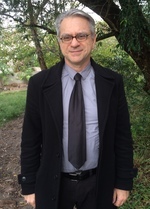 Richard is director of the Interdisciplinary Research Group Collaborative Environments for Creative Arts Research (CeCAR). He supervises a wide range of PhD students in music, performance, composition and interdisciplinary arts practice. Through CeCAR he was the artistic director of the International Space Time Concerto Competition (2012), a cutting-edge concerto competition that embraces historical practices with new innovations in performance. His interest in art/science relationships began in 1992 when he devised and implemented a pioneering interdisciplinary postgraduate and undergraduate music program within the School of Mathematics, Physics, Computing and Electronics at Macquarie University. This laid foundations for the later established Department of Media, Music, Communication and Cultural Studies within the Faculty of Arts. From 1989 to 2001, Richard was director and commissioning editor for music with Currency Press, Sydney. In this capacity he solicited and oversaw many books and publications on print music, recordings, manuals, and scholarly works. His own book Musical Environments: A Manual for Listening, Composing, originally published by Currency Press, has become a recognised text for secondary and tertiary music courses throughout Australia. In 2003, a new edition of this book entitled Sounds in Space Sounds in Time was published by Boosey and Hawkes, UK. Vella's music is lyrically and rhythmically engaging. His music creates a sense of deja vu and irony in his blending of contemporary approaches and forms with styles that seemingly sound familiar. The results are sound worlds that are both timeless and rich in reference. A Milonga, and Little Bossa Nova : Two melodies for flexible instrumentation and piano accompaniment (2003) Commissioned by Boosey & Hawkes (UK) in 2003 for an anthology based on flexible instrumentation. The publication did not eventuate due to internal structuring at Boosey & Hawkes at that time. Trombone concerto (trombone with full orchestra) (1995) Commissioned by Simone De Haan. Concerto for Solo Tenor Instrument and Orchestra : flexible instrumentation (1995) Originally titled Trombone Concerto, commissioned by Simone de Haan. Two choral works (satb choir with solo voice(s)) (1992) 'Remember' was commissioned by the Astra Choir (Melbourne) 1996.An earlier version of 'Unending Love' was first performed by Vocal Manoeuvres as part of the Brisbane Music Festival in 2000. Tales of love suite (trios: clarinet, piano, cello) (1990) The production Tales of Love was commissioned by the Australia Council for the Arts.